Mediven Plus maintains your leg health with the medical grade compression. Durable, opaque material will effectively reduce swelling and improve circulation to your legs because of the higher containment properties of this stronger material. Ideal for moderate to severe swelling and lymphedema. Wide range of sizes, lengths and options make the Mediven Plus a great medical compression stocking. Choose your size. You may need to take a measurements to get your size. 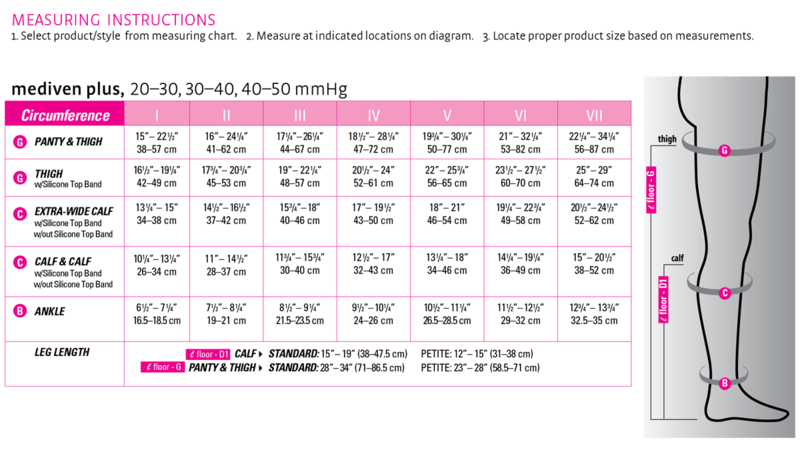 With your leg measurements, look up your size in the sizing chart in the images, or check out the Mediven Sizing Chart in a PDF. Choose between Standard and Petite lengths. Measure your total leg length. If it's below 28 inches, choose Petite length. If it's above 28 inches, choose Standard length. If you're shorter than 5 foot 7 inches, you may need the Petite length. Choose the toe style: Closed toe or Open toe. Please note: Only Beige is available for this item.